Coll. No. 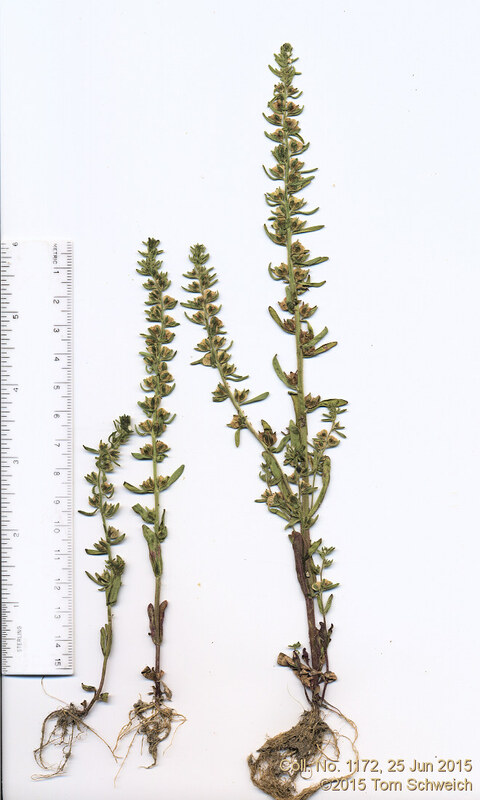 1172, 25 Jun 2015, characters observed: Emergent aquatic herb, to 20 cm., probably annual, glandular hairy throughout; Leaves, opposite, sessile, 24 mm. × 6 mm. wide, oval, margin entire; Inflorescence, an elongated terminal raceme; Bracts to 12 mm, reduced above; Pedicel (in fruit) 0.6-1.0 mm. ; Sepals, 4.5-5.0 mm., outer pair slightly larger; Flowers, small, corolla white; Capsule, 4.5 mm. × 5 mm. wide, notched 0.3 mm. ; Style, very short, ±0.1 mm. Field Notes: Coll. No. 1172, 25 Jun 2015.